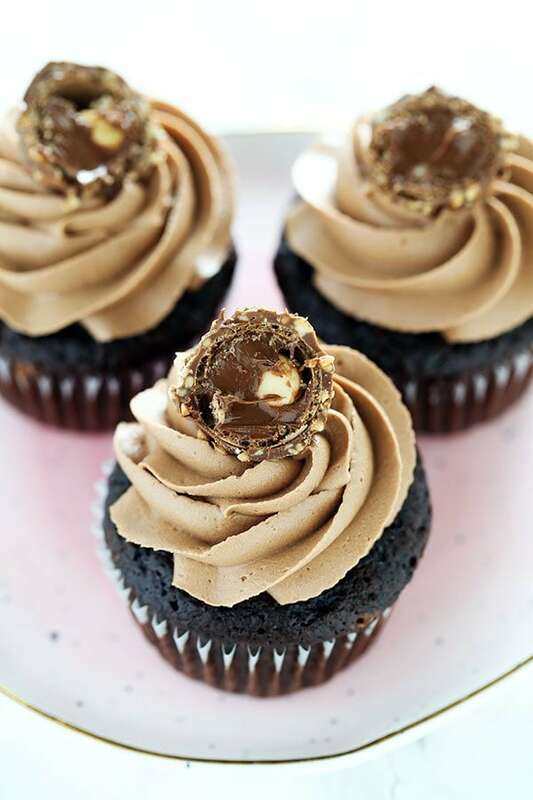 Ultimate Nutella Cupcakes feature my perfectly moist chocolate cupcake base which is filled with Nutella, topped with Nutella buttercream, and garnished with a Ferrero Rocher candy! It's Nutella perfection! Taste: Nutella overdose in the best possible way. 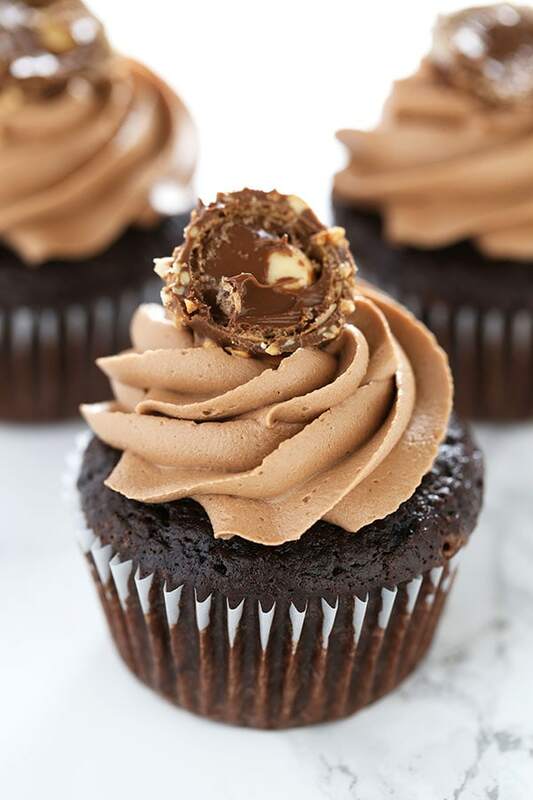 Texture: The cupcake is moist and tender, but sturdy enough to be filled with smooth and creamy Nutella and topped with thick and luscious Nutella buttercream. HEAVEN. Ease: Totally doable, but a little messy. 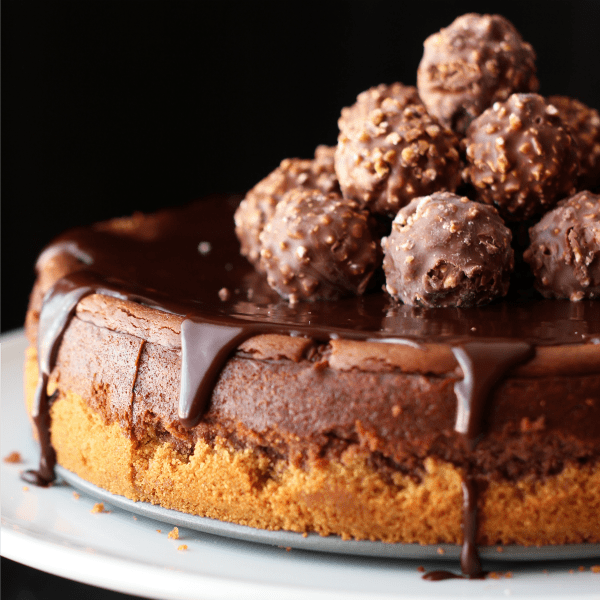 Pros: Amazing chocolate hazelnut decadence. There’s something magical about these Ultimate Nutella Cupcakes. 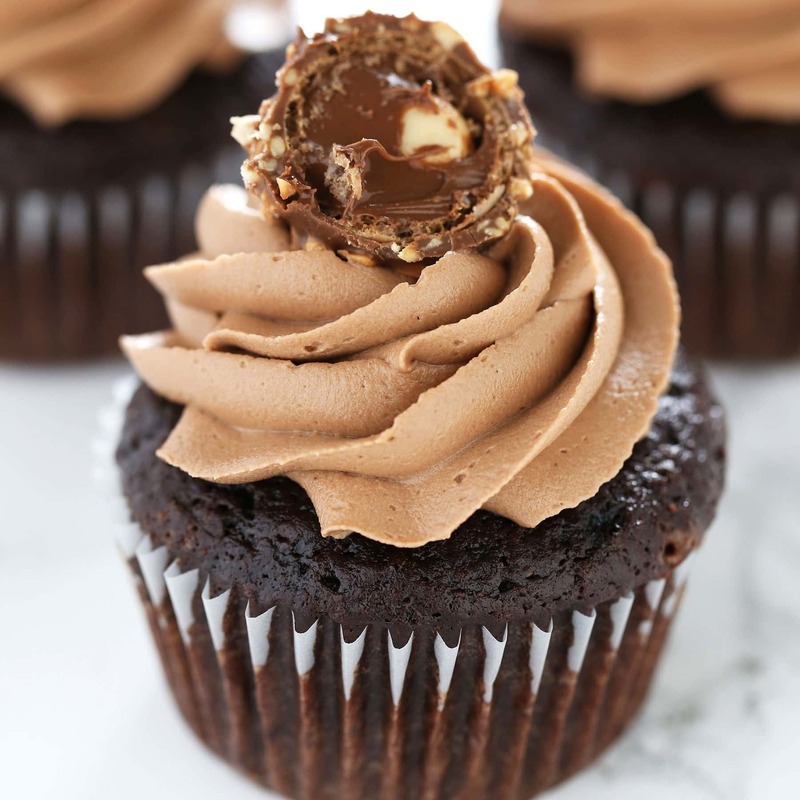 Nutella is pretty magical on its own, but when stuffed inside my best chocolate cupcake recipe and added into a buttercream frosting… well you just can’t beat that. 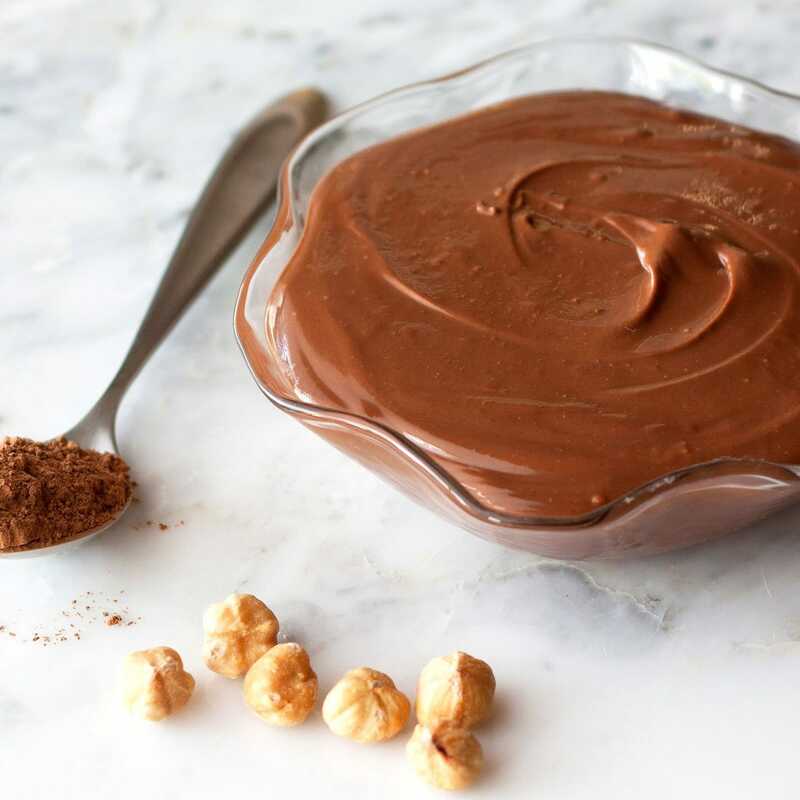 I’d love to travel back in time to the first person to combine chocolate and hazelnuts and see the look on their face as they take that historic first bite. So basically, a time machine would be completely wasted on me. That’s okay because time travel isn’t required to enjoy all the random discoveries and inventions people have made with food and baking over the years. It’s easy to point out the differences between baking powder and baking soda, or why an extra egg yolk added to cakes, brownies, and cookies adds richness, moisture, and a chewy texture now. But I can’t imagine the people who had to figure all that out in order for us to enjoy the array of baked goodies and treats we enjoy today! If you want to up your cupcake game, then be sure to check out my post on How to Make Perfect Cupcakes here. Meanwhile, preheat the oven to 350°F. Line a standard 12-cup muffin tin with foil or paper liners. Using a spring-loaded scoop, divide the batter evenly among prepared muffin cups. Bake until cupcakes are set and firm to the touch, about 20 minutes. Let cupcakes cool in pan on a wire rack for 10 minutes before removing from pan to cool completely, about 1 hour. Cupcakes can be stored in an airtight container at room temperature for up to 1 day. Use an apple corer or small paring knife to remove the center of each cupcake, being careful not to remove the bottom. Place the Nutella in a ziptop bag and snip a hole in one corner. 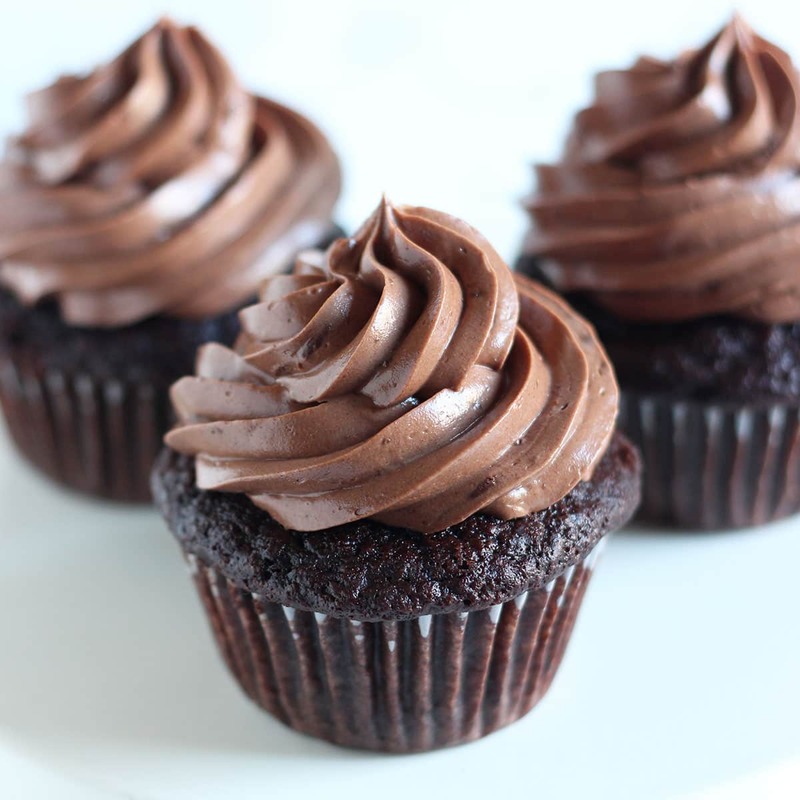 Gently squeeze 2 teaspoons of Nutella into each cupcake. In the bowl of a stand mixer fitted with the paddle attachment, mix together the sugar and butter. Mix on low speed until well blended and then increase the speed to medium and beat for another 3 minutes. Add the Nutella, salt, and vanilla and beat on medium for 1 minute, or until well combined. 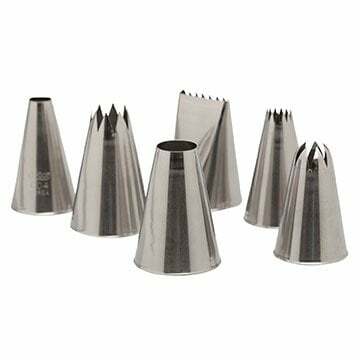 Fit a piping bag with a decorative tip and frost all the cupcakes. Top with a Ferrero Rocher candy, if desired. 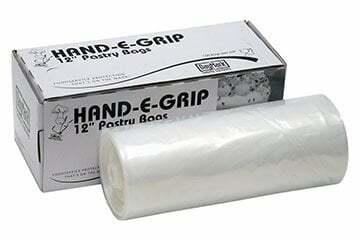 Serve or store in an airtight container at room temperature for up to 1 day, or in the fridge for up to 3 days. I want to bury my face in that buttercream. That is all. Wow. 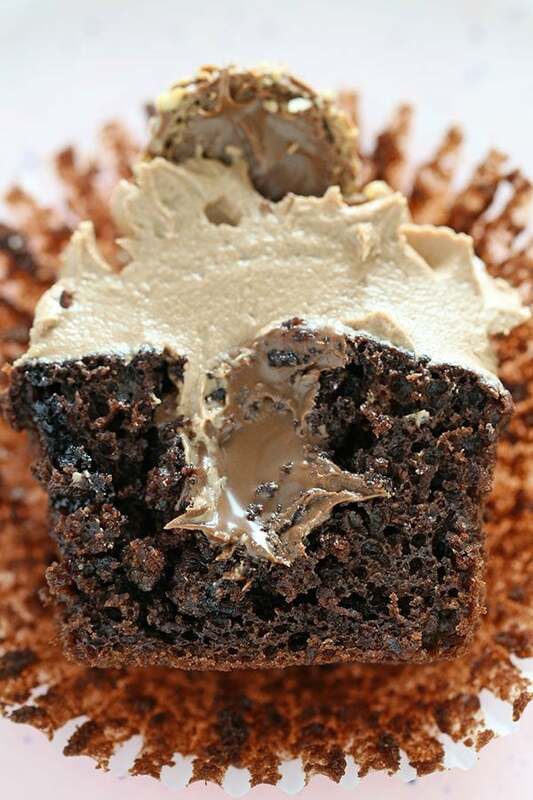 Oh wow, that chocolate cupcake is what dreams are made of, so glossy and squidgy! One of My favorite item,thanks for sharing this recipe! It looks delicious ! 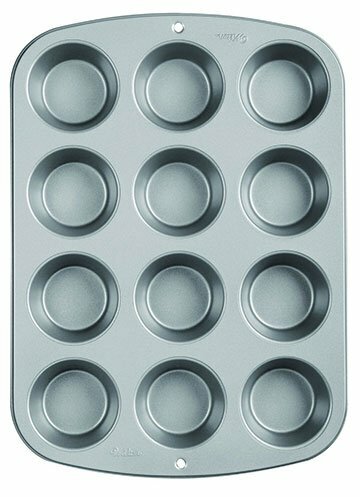 Can I bake a cake using the same recipe as for the cupcake recipe given above? Hey! Love these cupcakes, just wanted to ask, what does the sour cream do in the batter? That was all, thanks for the awesome recipe!